Then check out all the other Christmas loveliness we've stored up for you. The industrial trend isn’t just limited to our interiors, any style conscious gardener will tell you it’s seeping into our gardens too. This outdoor shelving unit from Cox & Cox not only looks gorgeous but is also a very practical way to store potted plants, herbs and gardening paraphernalia. Is there anything more satisfying than a well organised shed? Okay, well for you there might be, but for your green-fingered friend few things are more pleasing. These slate tags from Garden Trading are the perfect way to keep potting sheds and greenhouses neat and tidy. Keep their cuppa warm while they battle with the unruly buddleia with this Orla Kiely flask. You don’t have to be a gardener to appreciate this gorgeous copper watering can. But while us magpies may just be thinking how great it would look on our kitchen shelves, this watering can is the real deal. Made by Haws, who have been handcrafting watering cans in for 130 years, the quality is top notch. A bird feeder and a super cute garden decoration in one! Wildlife's happy eating from it, we're happy looking at it, what's not to love? 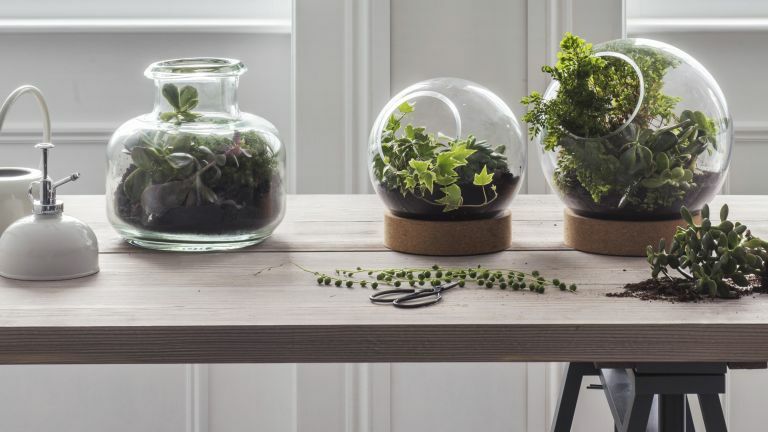 If you’re buying for a gardener who is also a bit of a home lover, these terrariums from Garden Trading are a great way to bring some of the garden inside. Fill them up with succulents and they become a pretty low maintenance, mini hot house, just stick them in some indirect sunlight, give them an occasional spritz of water and you’re sorted. Find more gifts for home lovers and follow our guide to creating a Christmas wreaths with succulents. Maybe the more seasoned gardener won't be interested in the fact that this Burgon & Ball hand rake was designed by Sophie Conran, but we promise you they will appreciate the name Burgon & Ball who have a bit of garden tool making mileage. Plus you can make this gift extra special by having the handle engraved. Help the gardening enthusiast in your life get super organised with this beautiful floral desk pad from Ohh Deer. This vintage veggie print from Trouva is either going to fill them with envy or just encourage them to plant yet another variety of bean down at the allotment. How many times can you pretend to look excited about another basket of a Borlotti beans? It may not be the most exciting gift but a good digging spade is an essential. This super tough spade from Burgon & Ball is endorsed by the Royal Horticultural Society, (for all you non-gardeners that's basically the ultimate accolade in the gardening world). If you want your friend’s gardening gloves to match their bedroom wallpaper, this Morris & Co pair are a winner. Obviously we are just all about the lovely classic print but these gloves also have plenty of gardening credentials – lightweight, but still durable with an adjustable strap for secure fastening. They also come with a Shea butter hand cream, which we know might be pretty generic but no true gardener can ever have enough hand cream. Chuck this biodegradable Pollinator Beebom into any corner of the garden and see this buzzing mix of wildflower seeds grow into colourful, nectar-rich flowers to entice bumblebees and honey bees. We just love this idea. This beautifully illustrated calendar provides gardening tips each month, plus a packet of seeds and information on the insects that they will attract to the garden. The perfect gift for nature lovers. Find out how to create your own wildlife garden. For the gardener whose fingers are more black than green, give their plants a better chance with this copper plant topper. Upgrade from the standard countryside green wellies to these Hunter gardening Chelsea boots. Designed in collaboration with the National Trust, these boots are lined with neoprene, incredibly durable yet very flexible. If you know someone who loves looking at beautiful gardens, grab them a copy of Period Living magazine, which features different plots every month, plus lots of inspiration and advice for keen and casual gardeners. In the shops now – or get a better deal with a subscription and treat them to an issue every month. Treat someone who loves the outdoors (but hates the cold) to a warming fire pit that will keep extremities from turning into icicles on crisp winter evenings and become the centre of garden parties in the summer. This cast iron fire pit from Waitrose (literally what can't you pick up from there nowadays?) is beautifully simple in design but large enough to hold a pretty stealthy fire. For a gift that keeps on giving, get the gardener in your life a membership to the National Trust. The membership includes free entry to over 500 places, free parking at most National Trust car parks plus a subscription to the inspiring National Trust Magazine. How about replacing that ugly trug your gardening friend lugs around the garden and get them a stylish (but of course practical) gardening caddy? This is perfect to just keep by the back door with a couple of tools in it, you could even treat them to the matching twine dispenser. Keep them organised with this botanical diary, plus it's filled with lots of useful gardening tips and bits of information about the Royal Botanical Kew Gardens. Want more Christmas gift inspiration?